Call of Duty: Modern Warfare 2 could be the largest video game launch in history and Activision isn't the only company looking to turn a buck on the game. Mad Catz has rolled out an entire line of third-party peripherals, including PC keyboards and mice, controllers, headsets and, most intriguing of all, a nifty Xbox 360 throat communicator. Does Mad Catz deliver with the military-inspired microphone or is the Throat Communicator a waste of time and space? Comfort: The lightweight throat communicator gently hugs your neck, making it easy to forget it's there within minutes of putting it on. The attached in-ear earpiece features soft rubber that fills your ear canal without any strain or pain. No more ear or scalp irritation for you. Isolated: These aren't military quality, so to use the throat communicator you will have to speak at normal levels. That kills off my dream of whispering to team mates during late night gaming sessions. But the microphone, which presses up against your neck, does a great job of cutting down outside noise. That means less echoes and less noisy roommates and music. I even tested eating with it, though to Fahey's disgust, he could hear what he swears was the sound of my mastication and swallowing. Muting and volume controls: With the fancy behind-the-neck design, it would have been nice if Mad Catz came up with a better system for earpiece volume control and muting. The dangling, rather small piece of plastic features a tiny switch to mute and a dial for volume which works just fine. But the extra plastic sort of kills the whole "I'm a cut-throat mercenary" feeling, leaning more towards the "I'm a douchey walk-and-talk businessman" vibe. Overall, I'm pretty happy with the Throat Communicator. In my time spent using it, the communicator was very comfortable and did an admirable job of doing what it says it will do. The volume dongle is a little off-putting but not a deal breaker. When it comes to inexpensive microphone upgrades for Xbox 360 Live, this seems like one of the best deals around. 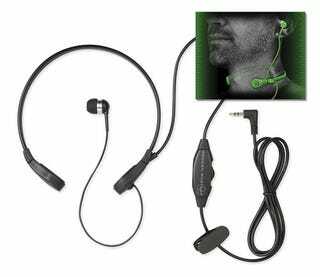 Mad Catz Throat Communicator for the Xbox 360 was developed by Mad Catz for the Xbox 360 and released on Nov. 10. Retails for $29.99 USD. A Throat Communicator was given to us by Mad Catz for reviewing purposes. Played several hours of Halo ODST and on Xbox Live with the communicator. Ate, cranked up the volume and had my son yell to test isolating effects.